the handbag and the earrings have been bought. The nails have been done.... now heading to get her hair done. The colors and fabrics seem so luxurious! Man oh man how times change. When I went to prom in 1984, I wore a powder blue dress that looked like something from Gone With the Wind, hoop skirt and all. ha! My boyfriend (who then became my first husband) wore a white tux with blue bowtie and cumberbund. Seems like a lifetime ago! She's be just gorgeous! What beautiful colors, yummy fabrics...aaahhhhh! Wishing her the loveliest prom & you the loveliest weekend, my friend! oh my gosh. that dress looks amazing. and the shoes. wow. i can't wait to see her all dressed up. so exciting. Incredibly beautiful, Sheila. I thought it was Kate Middleton and her wedding dress when I first looked. 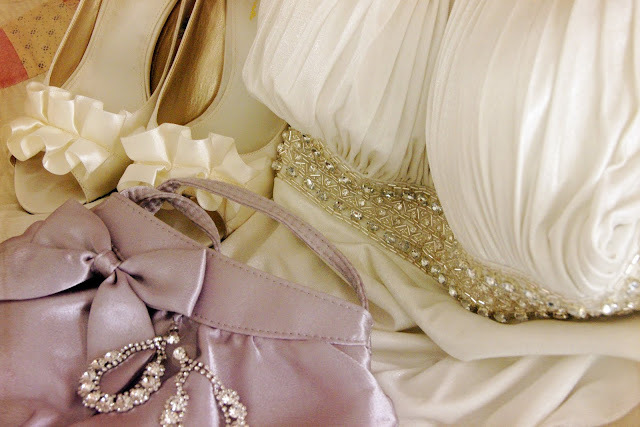 I loved the details on the shoes, the purse, the dress...so lovely! What fun!! I sure it was a wonderful time!